Hotshot was born at 5AM on the streets of Tokyo when American entrepreneur Danny Grossfeld was looking for some hot coffee before a meeting. After going store to store with no luck, he decided to settle on what he thought was a cold can of coffee from a refrigerator. To his surprise, not only was it actually a “hot fridge” and the cans were all hot; but that hot canned coffee was a $15 Billion Industry in Japan! Danny immediately went on a mission to bring this Japanese concept dating back to 1969, to the US. He set out to leverage the true innovation and convenience of the hot RTD concept, and make it acceptable for American tastes. The lengthy process of “Americanizing” the product included: raising the temperature from 110° F to 140° F; increasing the size of the can, creating formulas from scratch, developing entirely new heating technology; and inventing an insulated label to protect your hands. Throughout the entire process, the focus has been driven by taste and quality. Danny teamed up with a world-class flavor designer to ensure that the product itself tasted great, and was made with high quality ingredients and natural coffee. This has opened the door to introduce other hot beverages like hot chocolate, tea, and beyond. Years of R&D, 1500 formulas, Trademarks & Patents issued, and an appearance on Shark Tank; Hotshot was finally born in the summer of 2017. 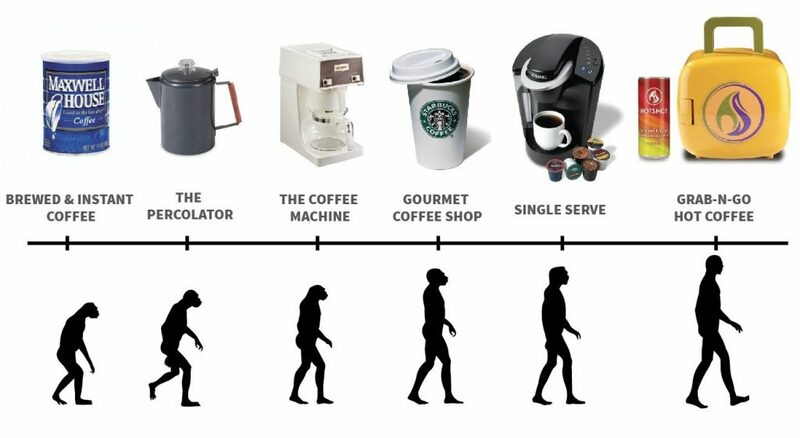 HotShot represents the next evolutionary step in coffee. Once you try one, it will be difficult for you to imagine waiting in line or brewing a cup ever again. Hotshot is more than just coffee. We plan on offering a wide variety of HOT beverages in the near future.